Ahh, Speary. 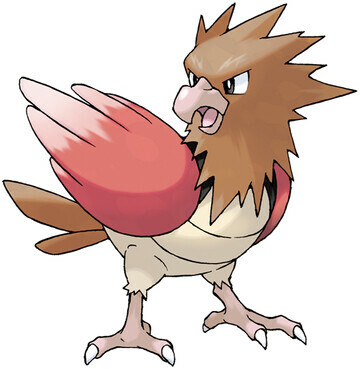 I don't think this winged critter is any better than Pidgey as far as battling goes, but for whatever reason I always liked him better. I think maybe because spears are cooler than pidges. Also, pidges aren't actually legitimate things, so they have that going against them. It also appears that Spearow's beak is a bit sharper, and he's already got Peck when you begin, while Pidgey just has the neutral Gust. Come to think of it, the only Flying move Pidgey actually learns is Wing Attack (Mirror Move doesn't count), which was super weak back then, and probably still is now. So that's why Pidgey is lower. Why is Spearow higher? Well, I kind of just answered that, but there are two words to further it: Drill Peck. Probably the best Flying move during this generation, it does solid damage and is accurate. And with the Same Type Attack Bonus (aka STAB to you diehards out there), it gets an extra boost whenever Spearow uses it. It's still super weak Defense-wise, but it can at least get a good hit or two in before it gets knocked out.